In J.R.R. Tolkien’s book, The Lord of the Rings, there was no “Brego the horse.” That Brego was introduced in the film adaptation of The Lord of the Rings: The Two Towers. From The Lord of the Rings, Appendix A: “He drove the enemy out of the Wold, and Rohan was not attacked again for many years. In 2569 he completed the great hall of Meduseld. At the feast his son Baldor vowed that he would tread ‘the Paths of the Dead’ and did not return. Brego died of grief the next year.” Brego was buried in the Barrowfield with Eorl the Young and all the Lords of the Mark who followed him. After Brego’s death, his son Aldor the Old assumed the throne and ruled for 75 years. You’ll find many more citations and details regarding the building of Meduseld in Tolkien’s Legendarium on StackExchange. 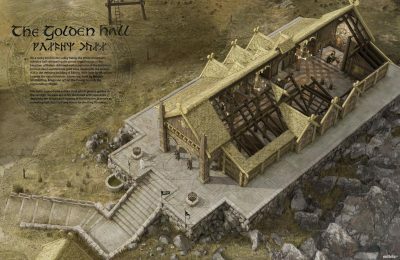 The image of the Golden Hall above was created for The Two Towers film by Adam Middleton, Lead Concept Designer at Weta Workshop. See also Adam’s story of how he built a scale model of Helm’s Deep. In the “The History of Rohan” video from Men of the West, you can find the story of Brego the King starting at around 5:37. Brego and Edoras are also referenced in the other videos in this playlist.